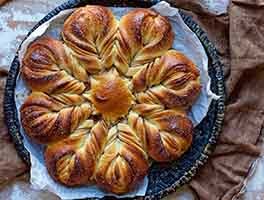 What looks like an intricately braided coffee bread is actually a "mock" braid, easily fashioned by even beginning bakers. 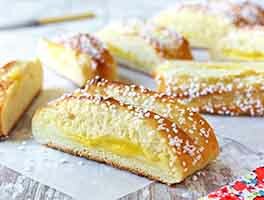 Filled with sweetened cream cheese and jam, it's both delicious, and elegant. 32 mins. to 36 mins. 4 hrs 2 mins. to 4 hrs 21 mins. Combine all of the dough ingredients in a mixing bowl, and mix and knead (by hand, mixer, or bread machine) to make a smooth dough. the dough will seem very dry at first; resist the urge to add more liquid. It'll come together and smooth out as you knead. Place the dough in a lightly greased bowl or other container, cover it, and allow it to rise for 90 minutes. It won't look risen at all. That's OK.
Divide the risen dough into two pieces. Working with one piece at a time, flatten/pat/roll it into a 10" x 15" rectangle. Make the filling: Gently beat together the cream cheese, butter, sugar, salt, flavor or extract, and ClearJel or flour until smooth. Add the egg, and again gently beat until only a few small lumps are visible. Spread half the jam/flour (or jam/ClearJel) mixture (about 5 1/2 ounces) in a 2 1/2"-wide swath down the center of the rectangle, lengthwise. Leave 1" of dough bare at each end. Spread half the cream cheese mixture (about 6 1/4 ounces) atop the jam. Make cuts from the edge of the dough to within about 1/2" of the filling, every 3/4", all the way down both sides of the dough. Starting at one end, pull the cut strips up and over the filling, alternating sides. Transfer the loaf to a lightly greased or parchment-lined baking sheet. Repeat the process with the remaining piece of dough. Cover the loaves, and let them rise for 90 minutes. Again, it won't appear to rise; that's OK. Towards the end of the rising time, preheat your oven to 350°F. 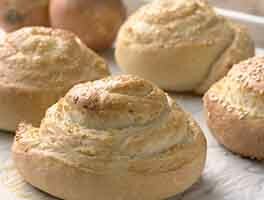 To finish and bake: Brush the egg white/water over the loaves. Sprinkle with the coarse sugar. Bake the coffeecakes for 32 to 36 minutes, until they're golden brown. Remove them from the oven, and place them on a rack to cool slightly. Serve warm. Instant ClearJel thickens without cloudiness, and without any "floury" texture; it also thickens better than flour. It's our thickener of choice, but certainly use flour if you don't have ClearJel. 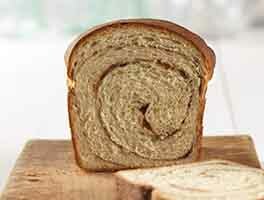 Perfect Pastry Blend, with its medium-level protein (10.4%), makes a lovely, tender coffee bread. If you use all-purpose flour, the bread will be a touch less tender; and you'll need to add an additional tablespoon or two of water to the dough. This coffeecake is also tasty drizzled with a simple confectioners' sugar icing (confectioners' sugar mixed with enough milk or cream to make it barely pourable). One of my favorite recipes. Always a hit at gatherings. Looks so professional. My favorite fillings are raspberry ham, lemon curd and blueberry. Would love to try peaches but do I leave them slices or cut into dice? Also, can thus recipe be halved? Don't use jam use pie filling (better taste and saves time). I didn't cut it in half and it was a hassle to get into the baking sheet so learn from my dumb mistakes. Great taste resembles a sweeter flatbread! I wasn't sure if the yeast and water should have been combined separately before adding to the rest of the dough mix, or the temp of the butter (room/chilled/melted) for the dough, but other than that the instructions were clear. It may have made more sense to chill the cream cheese mixture, put the cream cheese down first, then the thickened jelly to help maintain a better texture for the bottom crust. Definitely shape the dough on the parchment/baking surface so you don't have to try to move the assembled loaf. This dough crumbled and tore apart easily when assembling. 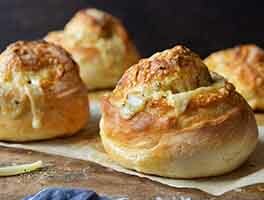 Tasty but Ill chose the other cream cheese braided bread recipe next time, it was a breeze. I am in love with this recipe! I have been looking for a way to use up extra jam and now I have the perfect use. These loaves are more delicious than I expected. My husband can't wait for me to make this using peach. I have already made strawberry and raspberry both were amazing. I have made these for friends and they were very impressed. 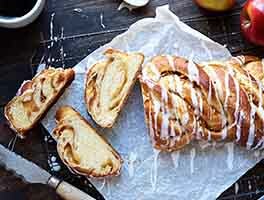 Delicious Danish style pastry. The dough is very easy to work with. My only suggestion is that you create a footnote for the flour in the ingredient list about adding an extra tablespoon of water if using all purpose flour. This piece of info only appears at the bottom under bakers tips - it should appear within the recipe itself. Also please consider including one reviewer's great advice to only add the clear jel to the jam when you're ready to spread it. It gets glue like and rubbery when it's mixed too far in advance. Very tasty! Figured it would be even though the dough over-proofed. The only thing I'd add is to roll out the dough then place it on the prepared baking sheet, then do the filling , cutting and braiding. The bread won't take on an odd shape. Love the fact that it makes two loaves one for us and one as a gift.